Do you enjoy tasty grilled BBQ during the summer? If so, perhaps you will know how important a good grill can be. The main reason for using a pellet grill is to cook great food every time. Pellet grills are able to do this by cooking food over hardwood pellets, to give it more of a delicious taste. This type of grill has certainly increased in popularity over the past few years and many people are purchasing them as they really make tasty food. Some people simply use them for their backyard BBQs for family and friends, while others use them in competition BBQ contests. The Cuisinart CPG-4000 pellet grill would be a fantastic item to have this summer, and if you don’t yet have one, in this article, we are going to show you how you can benefit from one. There are a couple of things you should take into consideration before purchasing a pellet grill. Not all pellet grills consume the same amount of pellets at any given time. This means before you buy you should do a little research to make sure you are getting what you want. Some models burn 4-5 pounds per hour while others use only 1 pound per hour. It is important to know the amount your chosen grill will burn to purchase the correct amount of pellets. If you purchase the wrong pellets for your grill, you may well run out during your smoking session and have nothing left to cook the remaining food. One of the most important features for a pellet grill is the possibility to have a temperature control algorithm that will be able to hold a consistent temperature no matter the weather. You will find a lot of pellet grills will have antiquated timing sequences, which maintain temperature. However, these systems will be based on the weather and therefore usually cause inconsistent results. 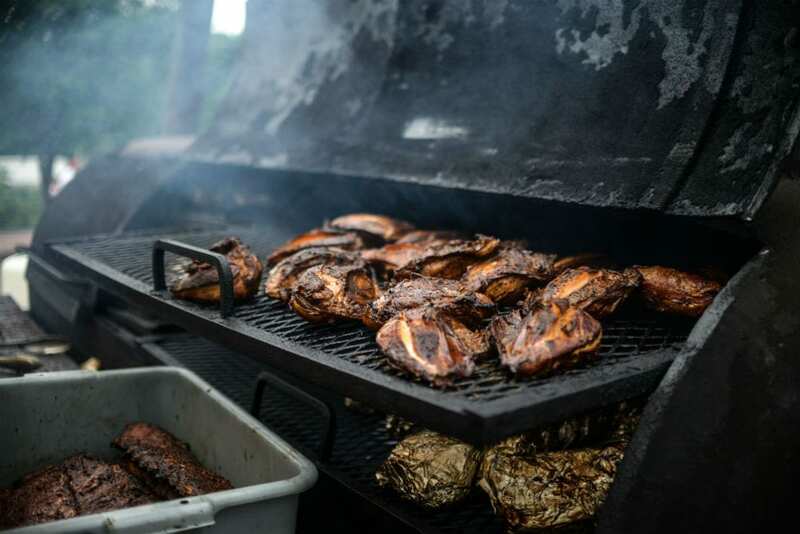 The best grills will have PID algorithms for temperature control. These are the same systems which are used in bakeries and are very accurate. The more modern grills will now have WI-FI connectivity which means you can control your grill from anywhere you like. This gives you the option to switch the grill on or off and even adjust the temperature at the same time. Pellet grills come in all sort of sizes. Some may have space to cook for the whole neighborhood while others are perfect for cooking for smaller sized gatherings. You can find grills which will do all kinds of cooking from grilling, baking, barbecuing, smoking and braising, and some which will do it all. Now we will present one of the most popular pellet grills on the market, the Cuisinart CPG-4000. This is a versatile smoker which can cook almost anything. 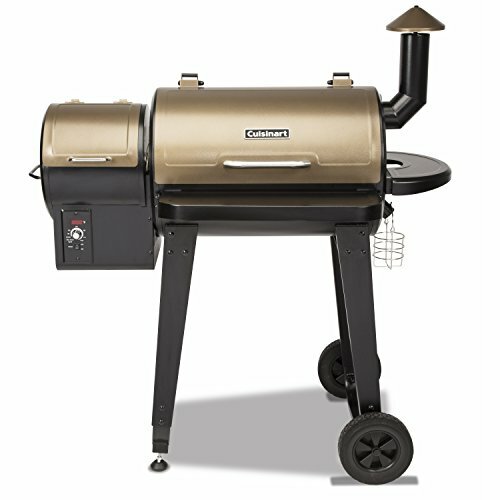 Are you looking for a new pellet grill? Then look no further as Cuisinart have the perfect smoker for you. Their CPG-4000 is a very popular choice on the market, as it is super versatile. We will take a look at the Cuisinart smoker below. Cuisinart specialize in grilling smokers and equipment, and their CPG-4000 is no exception. This grill and smoker is ideal for entertaining guests and makes dining al fresco a lot more fun. Whether you are grilling, smoking, braising, baking or barbecuing, this grill does it all. It can even slow cook and with its oven can bake foods like cornbread and pizza. It is basically a 6-in-1 grill, allowing you and your family or friends time to enjoy many different options. At the same time, no longer do you have to tightly pack everything together on the grill, as this one features a generous 450-square-inch cooking area, giving you room to space out and less worry. Usually gas grills are famous for flaring up, and when they get too hot can cause fires. As this is a pellet grill, you won’t need to worry about any flareups as the smoker will automatically manage the amount of fuel it needs. Simply pop in the pellets and you are good to go. Using a low temperature will allow the hardwood pellets to smolder and produce more blue smoke. With the Cuisinart grill, you can have peace of mind knowing that you are cooking at the right temperature. The thermostat includes an LED display which, as previously mentioned, maintains the heat by itself. It is possible to cook foods on low, slow or hot and fast. It can even add pellets to the fire when required. The Cuisinart CPG-4000 features a very sleek design and has 2 terrain wheels. This means you can easily move it around when you want, and a stable handle allows you to roll it out when you use it and easily back into storage when it’s not needed. Pellet grills are a good purchase to make as they can provide years of consistent tasty food, and allow you to relax as they take little to no maintenance to keep up. The Cuisinart CPG-4000 pellet grill and smoker is certainly worthy of your attention if you are looking to start grilling or if you already are an expert griller. This griller is fairly easy to set up and use, and will provide many tasty meals. We hope this article has inspired you to start using a pellet grill for your BBQs in future, because of how much tastier they can make your food. If you want to be a hit next time you are grilling, make sure you try one of these.